As I sit here writing this post, the 5th day of Passover is almost over. My supply of matzah is already half eaten, though there is still more than enough left to do a matzah brei tomorow. This year, as usual, I attended 2 Seders. The first one was a Swedish one – Progressiv Judendom i Stockholm’s Seder. I’ve been on the board of PJS for over 10 years and as a board member, I help out with all the activities we have done through the years. This year we did an especially good Seder. 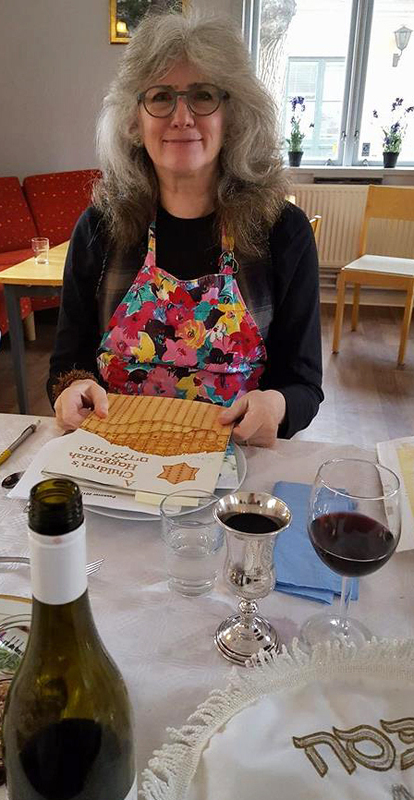 Eva Ekselius, with the help of Marianne Prager and Mats Frisk, led us through the Haggadah and even added other interesting tidbits of information. Marianne’s singing and Mats’ guitar playing were wonderful and helped to make it a fun evening in spite of the fact that I was in the middle of having a horrible cold. I can only hope I didn’t infect everyone I talked to that evening. Oh, and the food was good too! And then, a few days later on Good Friday, I led my J.A.P.S. * Seder as I have been doing for almost the past 20 years. These people are my minyan, my family, that I feel like I gave birth to here in my adopted homeland. The Jewish People have a long history of moving from one country to another (not always as voluntarily as my choice was) and building from scratch, a full Jewish life in the new place. It wasn’t until I moved to the land of the blue-eyed blond that I discovered just how much the Jewish life I left behind in New York City meant to me. And how much I needed it. I knew I would miss friends and family but I didn’t know I would miss Jewishness. So I set out to rebuild it for myself and for my son. And 20 years down the line I feel I have succeeded. At this point, we are 7 families with children (can we still call them children if most of them are not even teenagers any longer?) and a few who come on their own. This year the group was smaller than usual because a number of us were traveling to other places. But still we filled my Co-op’s party house with 20 people. I won’t bore you with a long speech. I have a cold and don’t feel really up to long speeches. We are a rather small group this year. A lot of our young people are not able to be with us. Many of our children are now old enough to have their own agendas, not just what their parents want them to do. This absence of our youngsters, made me think of the reason we are commanded to celebrate the Passover – to teach our children. To tell them the story of the Exodus, to remind them that once we, as Jews, were slaves and now we are free. By commanding us to tell our children, the entire process of Passover becomes a generational event. 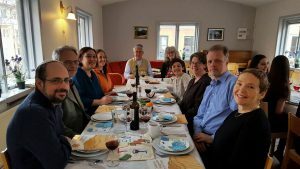 To tell our children, we need to also have the mothers and fathers at the Passover table – mothers and fathers who once were themselves children, listening to the story their parents told. My grandparents, immigrants from Poland before the second world war, were the first people whose Seder I remember being at. They didn’t do much story telling – mainly because they really didn’t know much about it themselves. But it always somehow felt very authentic to my child’s mind though my mother told me that my grandfather basically just said Kiddush and then we ate. But he said it with a strong Yiddish accent so I guess it just felt more real. After my grandfather died when I was ten, my mother and my aunt took over hosting the Seder – alternating years between them. By then, our families had graduated to using the free Maxwell House Haggadahs that many American Jewish families in the 1950s and 60s grew up with. Each year we would take turns going around the table reading portions from the color-coded and illustrated texts. It was a sort of Haggadah for Dummies. It told you with detailed instructions what you were supposed to do and when. We sat there and endured the boringness of the ritual, once again just waiting for the food without really understanding what the words meant. It wasn’t till I was no longer a child and, on the outside at least, finally a grown-up, that I was invited to a Seder led by someone who actually knew what the whole thing was about. It was then that I realized that it didn’t have to be that meaningless mumble that it had always been my whole life. Since then, I have tried to lead a Seder that had meaning. I don’t know if I always succeeded but I tried. It has to be about more than just waiting for the food to show up. Passover is truly about generations of parents passing on this story to their children and then they to their own children and so on and so on. My greatest hope (well maybe not my greatest hope but at least as it applies to Jewishness and Passover) is that my passing on of the Seder story to our next generation will continue into the future as it has for several thousand years past. In addition to the absence of some of our children, when I look around this group I remember some who have celebrated with us who are no longer able to be here. Last year Marina’s mother, Rachel was here with us. Before that Danielle’s mom, Lydia celebrated with us and even further back my own mother, Evelyn. Now they are no longer able to share in our Seder or pass on what they know to their daughters who are still here. So I want to start this year’s Seder by asking Danielle and Marina to join me in lighting the candles, in memory of our mothers, as we once again start the yearly telling of the story of the Exodus – of our people’s journey from slavery to freedom. This evening is the eve of the Jewish Holiday Yom Kippur, the Day of Atonement. It is probably one of the most important holidays in the Jewish Calendar. Unlike most of the other Jewish holidays, Yom Kippur is not celebrated by eating a large quantity of food. On Yom Kippur one is supposed to fast for the entire day. And one is supposed to atone for the sins you have committed in the past year – to say one is sorry, to ask for forgiveness and to forgive. This evening is also the evening before I leave for my trip to New York City. I stand next to my bed and look at the piles of clothing and other things that I have been laying out – choosing what to bring and what to leave behind. Is this item what I want to take with me on my trip or is it something I want to and can leave behind me, unneeded? I feel these piles are also an apt metaphor for Yom Kippur. Between Rosh Hashanah and Yom Kippur one must ask forgiveness from those one has wronged. And on Yom Kippur you are judged whether you have done right. I have hurt people. I have said unkind things. For this I am so very sorry. And like the items on my bed that I choose not to bring with me on my trip, I would rather not carry my atonement and its subsequent forgiveness with me. It’s not enough to just ask for forgiveness. The other half of the equation is that forgiveness is given. Without that, the books can not be closed and the journey becomes harder to continue. I guess when I was younger, I thought that by the time I had reached 65 I would have figured out Life, be settled – know where I have come from, know where I am, know where I am going. But even at 65, it is still all so confusing. Where am I going? How will I live my life? What am I doing? Tomorrow I will be traveling to New York City – the city of my heart. The first time back to the East Coast in over four years. The place I left almost 30 years ago to live here in Stockholm. I will be staying there for a whole month – the longest time back there in over 20 years. I am no longer the same person that packed her bags in 1987 to move to a foreign land. How will it feel to be reunited with my heart? Will we even recognize each other? And after that month, I will return here to my home, Stockholm, to pick up the pieces of my life once again, hopefully forgiven. With all my baggage, all the pieces taken with me and even those I thought to leave behind – all the pieces of my life. This year was a very busy one for me Passover-wise. 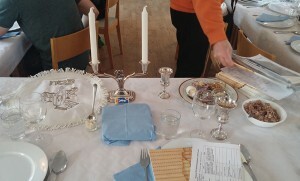 I organized or celebrated or participated in almost 4 Seders this past weekend. The planning process started many weeks ago for two of them. While not an actual Seder, the weekend started off on Friday evening with dinner at the home of the chair of the Progressive Judaism i Stockholm association. Together with other board members, I had a chance to sit down to a wonderful dinner and a lively conversation with Rabbi Eli Reich who would lead the PJS Seder that I would attend on Saturday evening. Later that night, at 12.30 am, I sat down with my cousins in New Jersey at their Seder via SKYPE. And finally on Sunday was my own J.A.P.S. * Seder which I have been leading since the late 1990s. I had the following words to say before we started this year’s Seder. Hi everyone. I want to start off by saying that I am very glad to see all of us gathered here together again to celebrate Passover. Two days ago, on Friday night, I was able to take part in the Seder that my cousins held in New Jersey. At midnight, my laptop sat on my kitchen counter while I prepared the matzah balls which we will all share later this evening. A similar laptop sat at the dining table in my cousin’s house in the US. Through the miracle of modern tech, I was able to say hello to my uncle & aunt and all their children and grandchildren. And they were able to see me sitting here in Stockholm as I listened to them saying the prayers and eating their matzah. I think our group of Jewish Americans here in Stockholm have been gathering, most of us at least, to celebrate this holiday since about 1998. Back then our children were all little kids and now as I look around, a good many of those kids are looking pretty grown up these days. When I used to make my list of who were coming to a J.A.P.S. gathering I usually grouped people by family and the emails went out to the grownups. But now our younger family members are starting to have their own position on my list. Many of you have had your own emails for quite awhile already. You, Carly coming with Peter, you have your own space on that list, as do Nadine with Mattias. As one gets to the point of volunteering your own contribution of what to bring to our holiday gatherings, you get your own place on the list. And that is as it should be. For all the years I attended Passover Seders when I still lived in New York, I don’t think I ever brought anything more involved than a bouquet of flowers to either my mother or my aunt’s house. My Mother and my Aunt took care of all the food. My Grandmother while she was alive contributed the chopped liver. The holiday of Passover is a time for looking backward, as we remind ourselves of the days when we were slaves in Egypt; a time for looking at the present and being grateful that we can live our lives as free human beings; and a time for looking forward when we end the service with the thought of next year in Jerusalem. 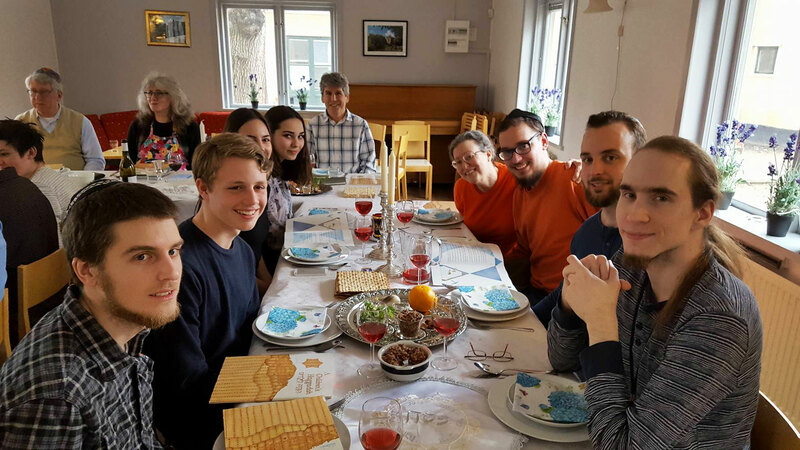 Probably the idea of looking back is why, as Passover draws closer, I often find myself thinking of past Seders which I have been part of with my family and my cousins. Most of my family members were loud, noisy and opinionated and seriously lacking in any diplomatic skills. Traits which I have also inherited, for both good and bad. No one was able to finish a sentence before someone else butted in and every statement was met with a rebuttal. My father and my aunt, who both married into the family learned to keep pretty quiet. Each family gathering contained at least one argument about something and rarely did we get through a whole meal without someone leaving the table crying. We just accepted that as normal and saw no problem with it. I don’t know what the outsiders I occasionally brought with me must have thought of us. But regardless of all that, I still find myself remembering those Seders fondly because of the memory of family that they bring back. And that was something I missed, here in Sweden, family. This group of people, all of you sitting here tonight are here because I gathered all of you together! I didn’t do it for any of you or to satisfy your needs. I did it totally selfishly – I did it for myself. Because I wanted a family that I could feel comfortable sharing Passover with. I had no way of knowing if the people I met almost 20 years ago would still be here with me, sitting in front of me, today. But here you are. Starting in June I will officially be retired, a pensionär as we say here in Swedish. I have no idea how this happened. How did I get so old? I admit that it was not something I was looking forward to. But here I am. Standing on the brink of a new chapter of life. The words at the end of the Seder about “next year in Jerusalem” are often believed by the orthodox to express the hope that in the future the Jews will return to Israel and rebuild the temple. I don’t take it so literally. I believe that it is a metaphor used to express the belief and the hope that we Jews will have a next year. And another. And another. That we will have a future. And I for one can say, that as I enter this new chapter of my life, this uncharted future, I am so glad that I can start this journey with this family that sits before me. So now let us start our Seder, and retell the story of our past, be grateful for our present and look forward to our future.